All week my family has been sick. It's november and the flu's already started *sigh*. I survived the first part of the week but unfortunatly, it got me too by the end of it, *another big sigh* even worse, we're throwing our baby girl a birthday party this Sunday and I have a lot of cooking and baking to do. Hope this thing goes away asap - it's unlikely, but one can hope! I've been baking a little this week, another loaf of bread and chocolate chip cookies. I've actually baked this loaf several times now because I love this recipe. 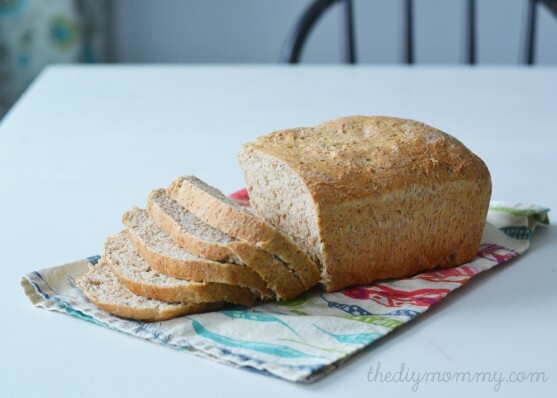 It's easy and delicious and the bread is fabulous when it's toasted! And what I like most about it is how long it stays soft. I just wrap it in a clean kitchen towel and keep it on the counter, it stays soft for about 5 days. My little girl loves to bake with me. She thinks it's so much fun to watch (and taste) the doughs and help measuring and pouring ingredients into the bowl. I think it's so nice when she wants to watch me in the kitchen, we have such nice moments there. Last night we made chocolate chip cookies. Everytime she got a taste of the dough her face lit up and she got so happy. Exacly that is what I love about food, the emotions it brings out in people. How a taste of cookie dough can make my litle girl smile like that and laugh because she simply loves the taste. It's fascinating to me. I've tried this with regular flour and it worked great too! HERE you will find the recipe and how to make the bread. If you're having trouble with the measurments just remember that one cup is about 2,4 dl, when you know that it's quite easy to mutliply or subtract (or just use a calculator).